1200-1300 [people] were wild about Kim Wilde in Antvorskovhallen Friday night. Not as many as expected, but there was light and music for those who came. And it could be heard too. 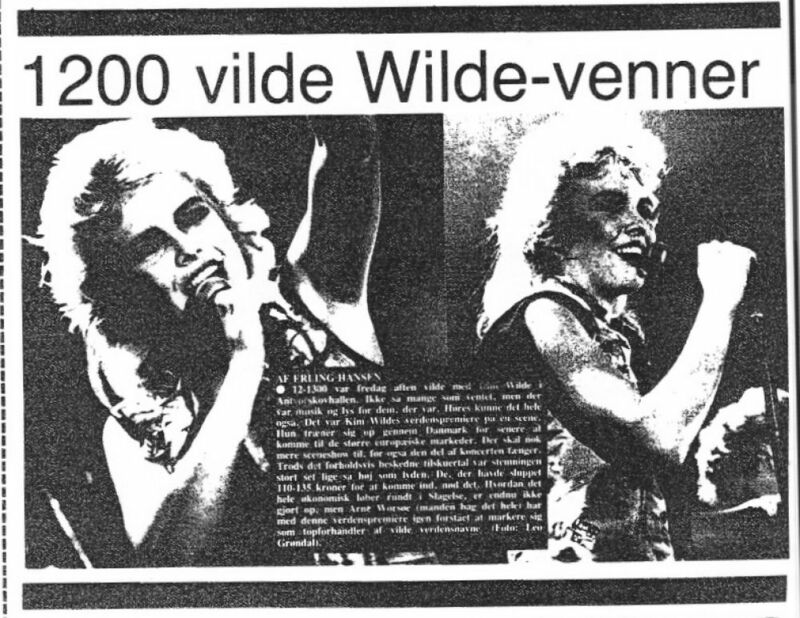 It was Kim Wilde's world premiere on a stage. She's training herself up through Denmark before she will later come to the bigger European markets. It will probably take some more stageshow before that part of the concert 'catches fire' as well. In spite of the relatively low number of spectators, their mood was almost as high as the sound was loud. Those who paid 110-135 kroner for being let in, enjoyed it. How the whole thing ran financially hasn't been calculated yet, but Arne Worsøe (the man behind it all) has with this world premiere once again understood to mark himself as a topprovider of 'world names' [very famous artists]. Kim Wilde: "My brother Ricky composes, daddy writes lyrics, and I get gold discs"